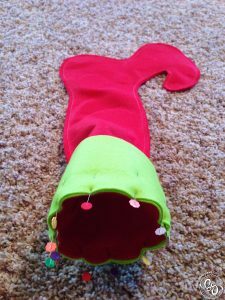 I finally found some time to finish up our christmas stockings. 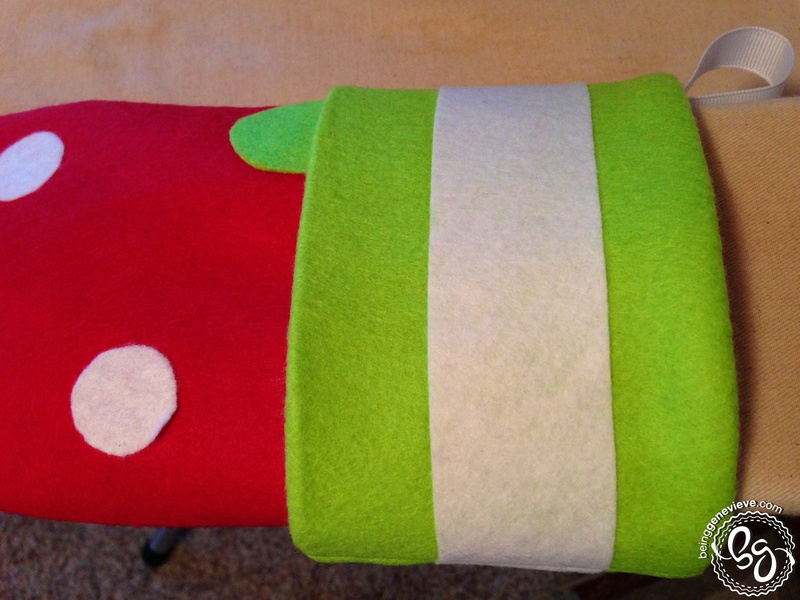 I am so pleased by how these stockings turned out. 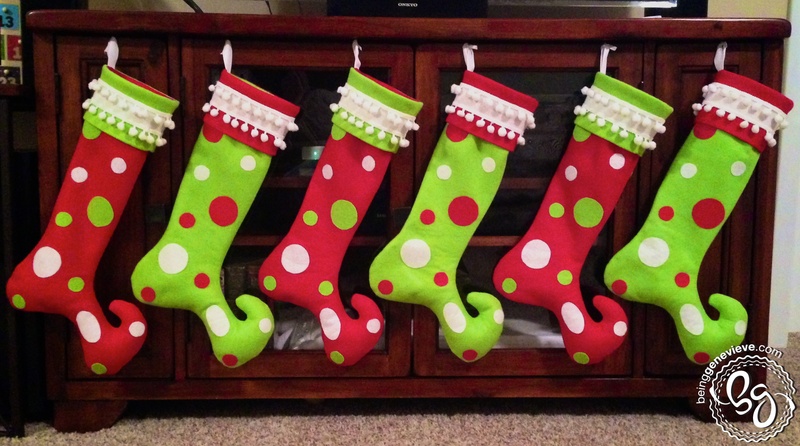 They remind me of the stockings that the Who’s would have in How the Grinch Stole Christmas. 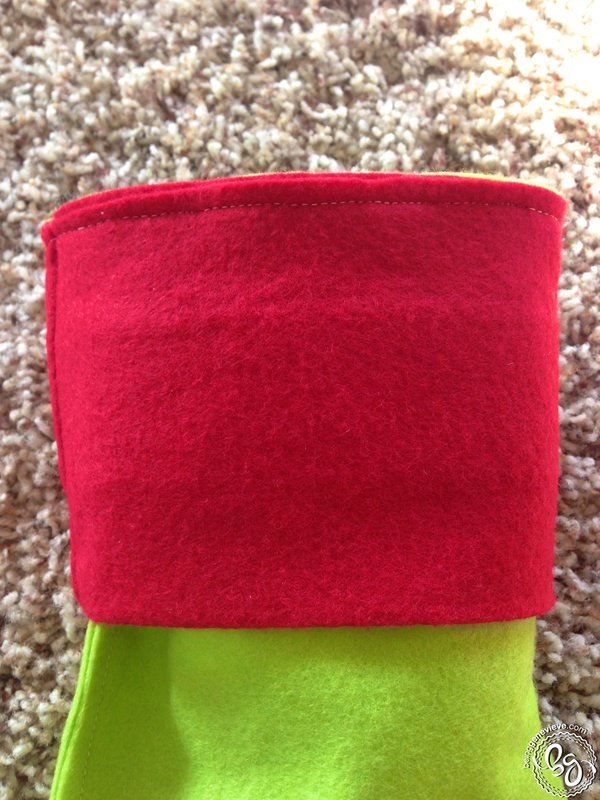 Braxton, my 4 year old, thinks they look more like elf stockings. Either way I love them. I am so excited to finally have all five of the stockings match and that they aren’t giant size! 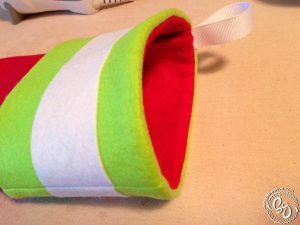 Let’s face it, if your stocking is huge you fill it, if your stocking is small you fill it. 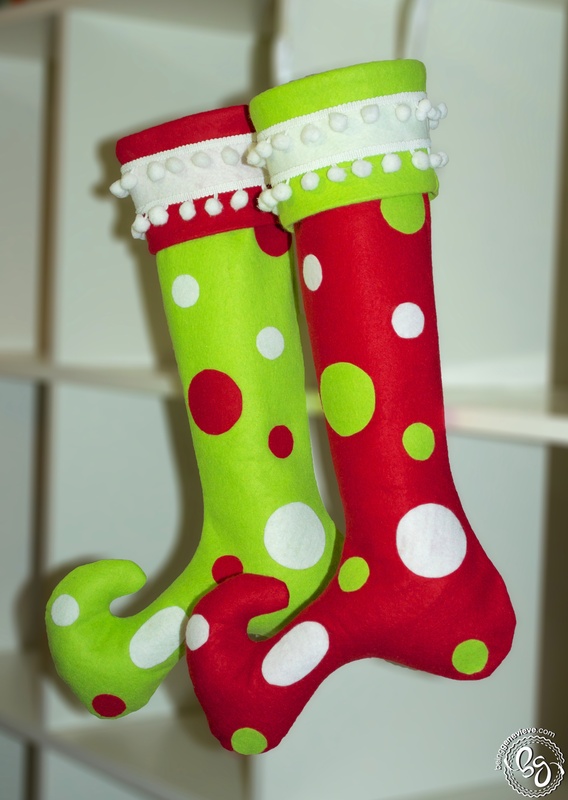 Why not have smaller stockings so you have more money to spend on larger gifts? Finished dimensions are: Top down to the heel is 17″, heel to the toe is 9-1/2″, and the width of the top is 6″. Print out the pattern. 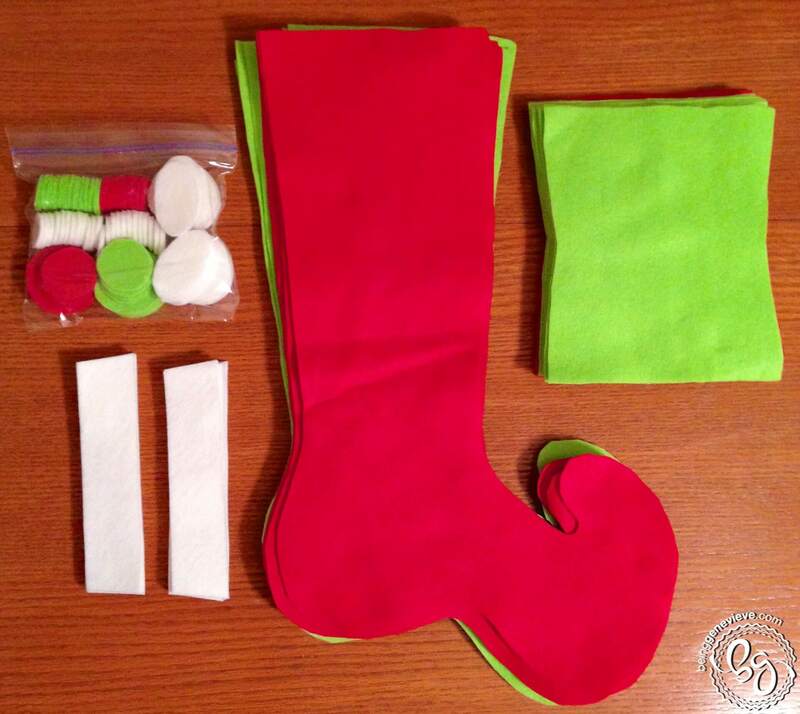 Cut and tape together stocking pieces. 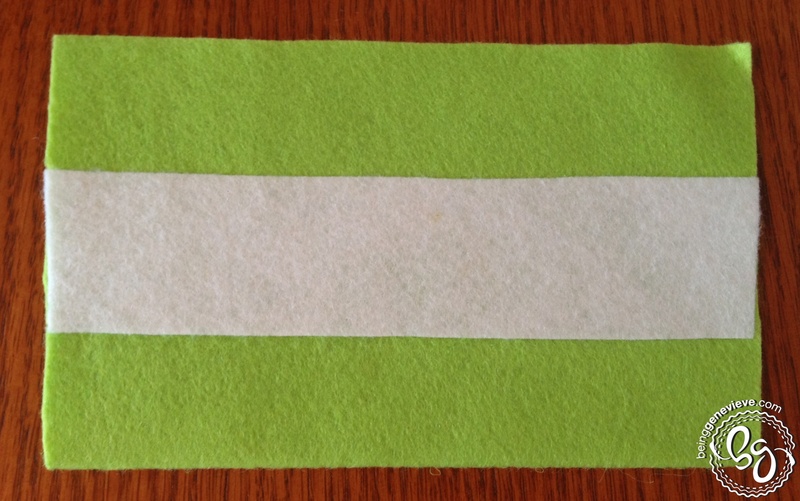 Begin by cutting out all your supplies from the pattern. Note: BEFORE cutting any of the white pieces and the polka dots. Apply your heat ‘n’ bond to the back, but only to the white pieces and the polka-dots. 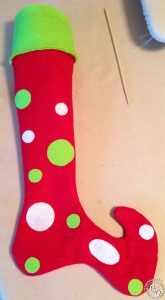 Now arrange the polka-dots onto the stocking how you like and use an iron to set the heat ‘n’ bond. Be careful not to melt your felt, but do apply enough heat so that the bond is strong. Repeat for the opposite side of the other stocking. 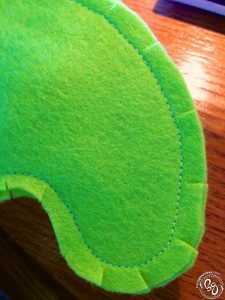 Note: You may blanket stitch around each polka dot to give it a more finished look if you would like. 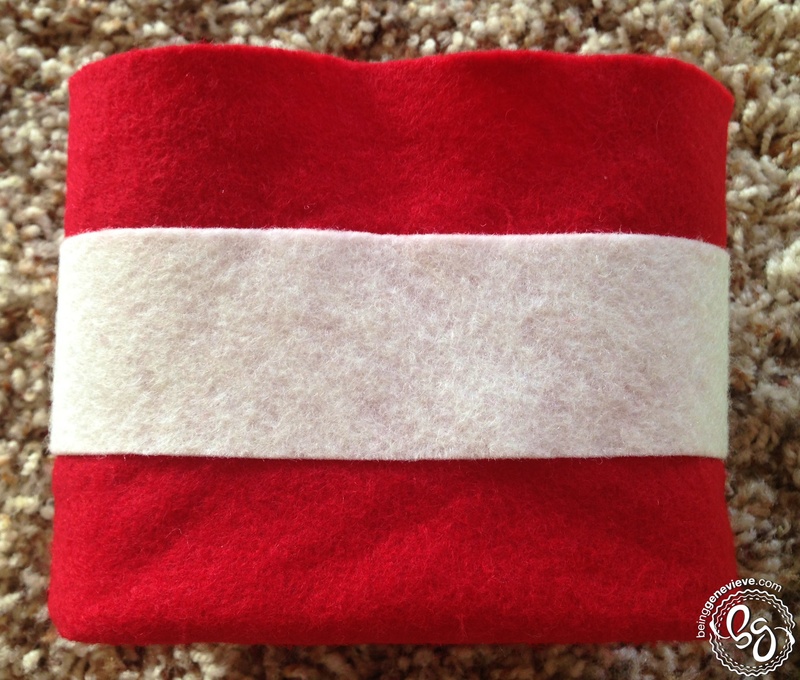 On your sock cuff you will now line up the white stripe with the little slits you made from the pattern and iron it into place. 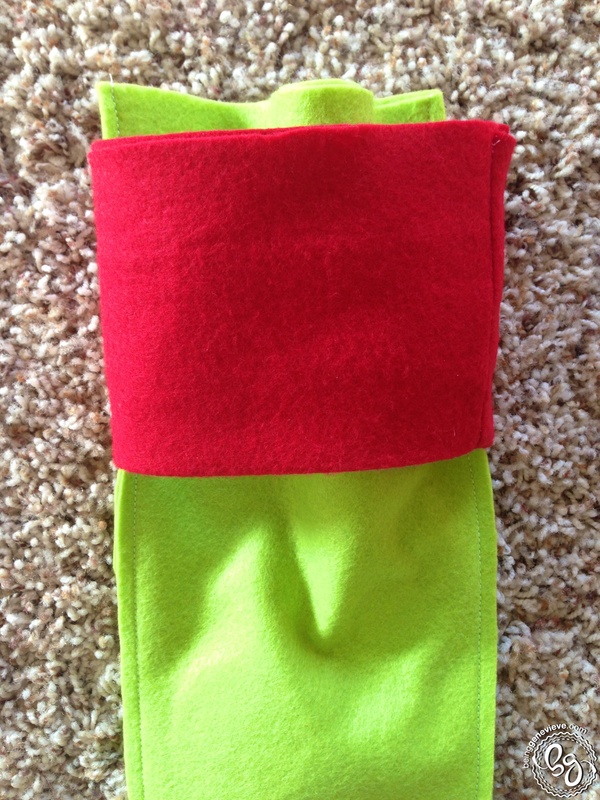 Fold the sock cuff in half and create a firm crease with the iron. 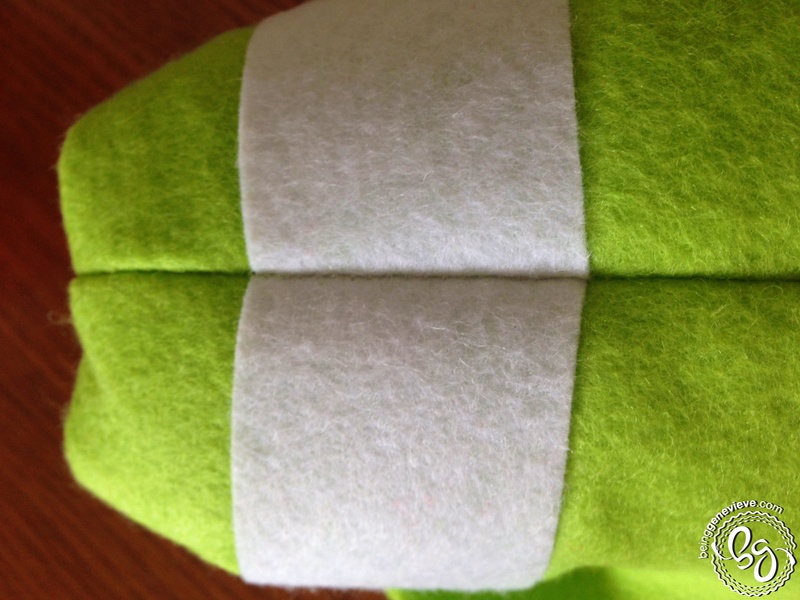 Align the two sock cuff pieces together, making sure the whites are matched up on the sides. 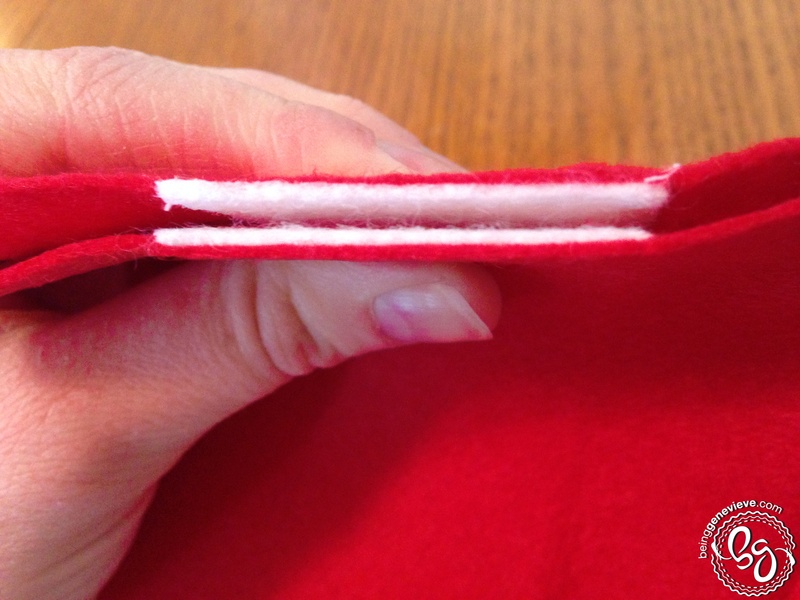 Sew along the two outside edges, leaving the top and bottom open. Lay the two stocking pieces together with the polka dots on the inside. 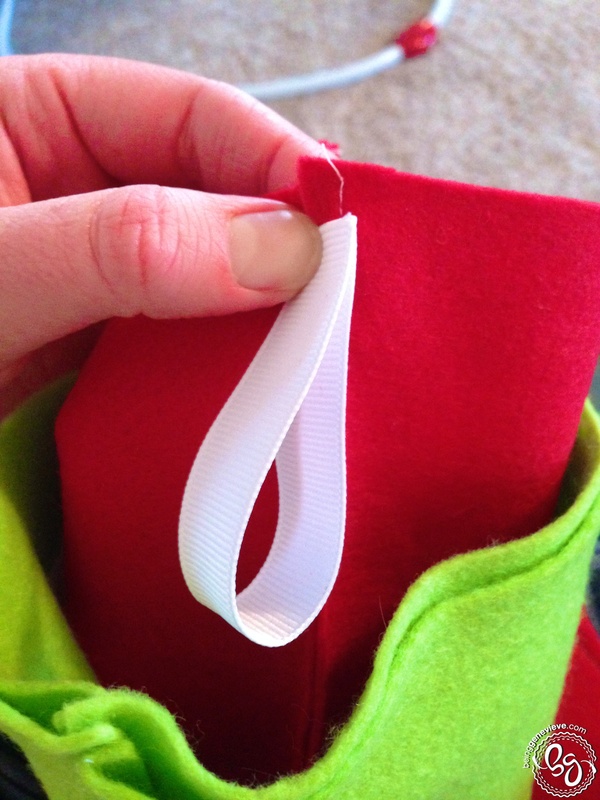 Sew around the edges, making sure to leave the top open and un-sewn. 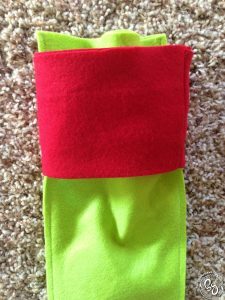 Flip the sock cuff with the right side facing out and fold in half. 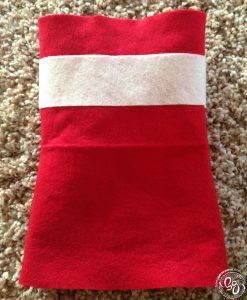 Now flip it so that the cuff stripe will be next to the wrong side of the main body of the stocking like the picture below. Before you pin the sock cuff to the main body of the stocking you will need to pin the ribbon on first. 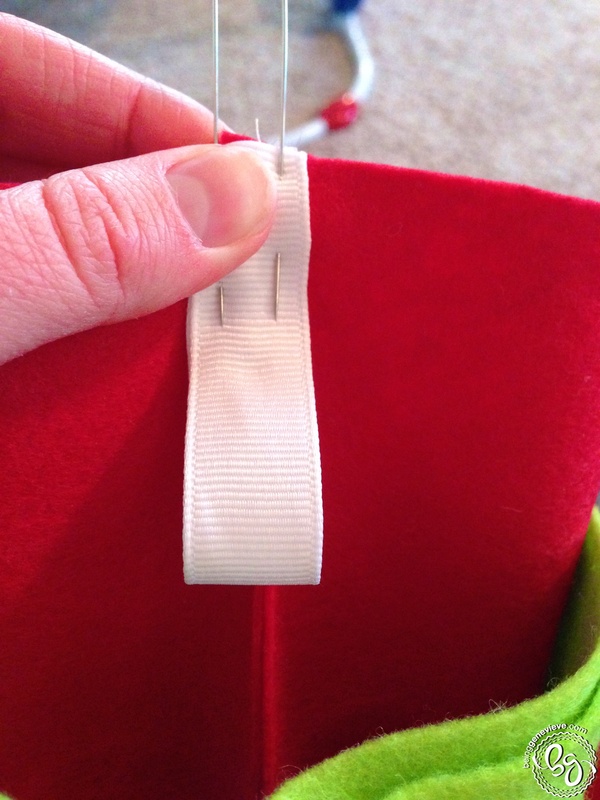 Fold your 5″ ribbon in half and pin to the fold on the back of the stocking. Now you will pin the sock cuff to the stocking. 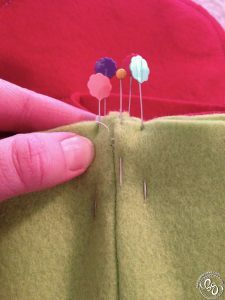 After everything is pinned together well, you can sew it together. Now is the time to flip it right side out, but before you do. You should clip the seams of the curved areas on the foot of the stocking. This will help it lay nicer when right side out. This is not a necessary step. I just prefer to do it. 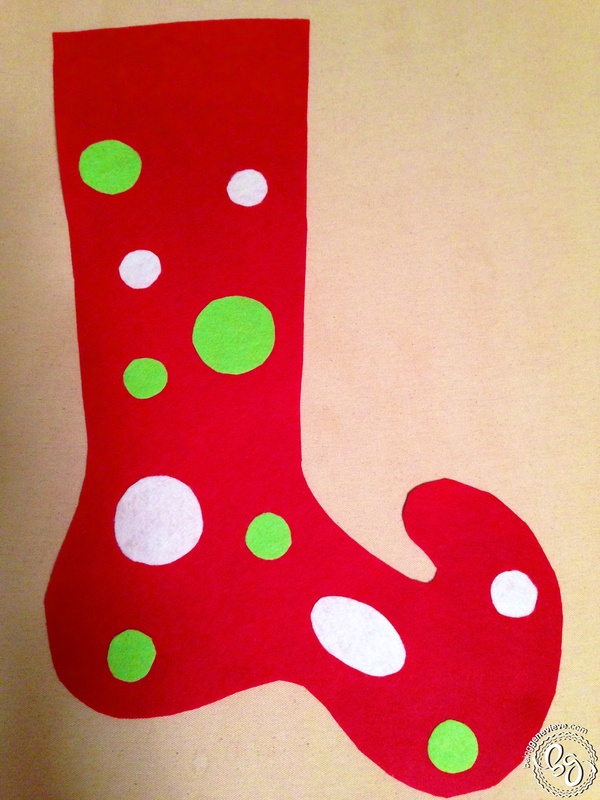 Flip the stocking right side out and iron the polka dots once more to make sure they are stuck very securely. 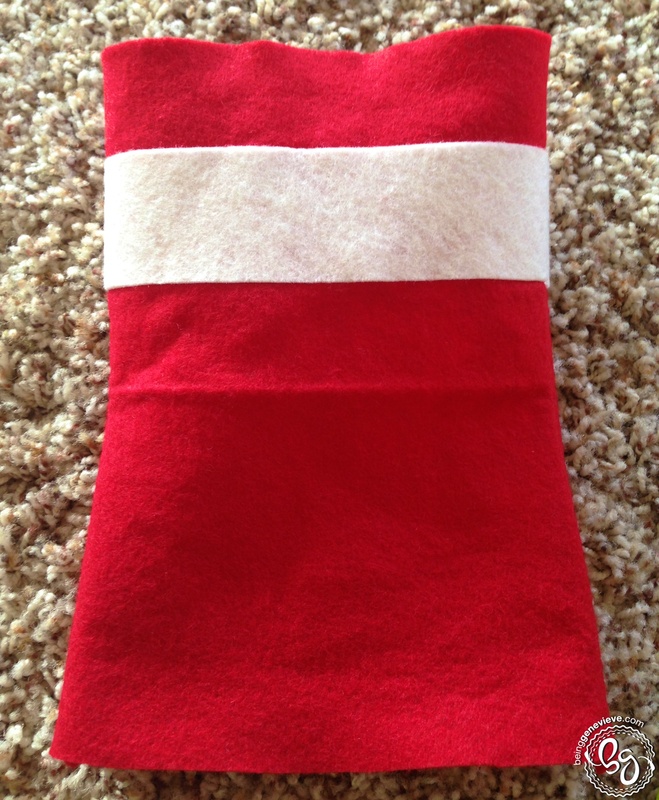 Flip the sock cuff down and iron it to create a crease along the top of the stocking. Now all you have to do is your pompom fringe. I have a confession: I tried sewing it on for over 45 minutes, but couldn’t ever get it to line up just right. It kept slipping along the presser foot. I finally gave up after unpicking it for the millionth time. I decided that stockings don’t ever get washed so hot glue would work great for what I was going for. 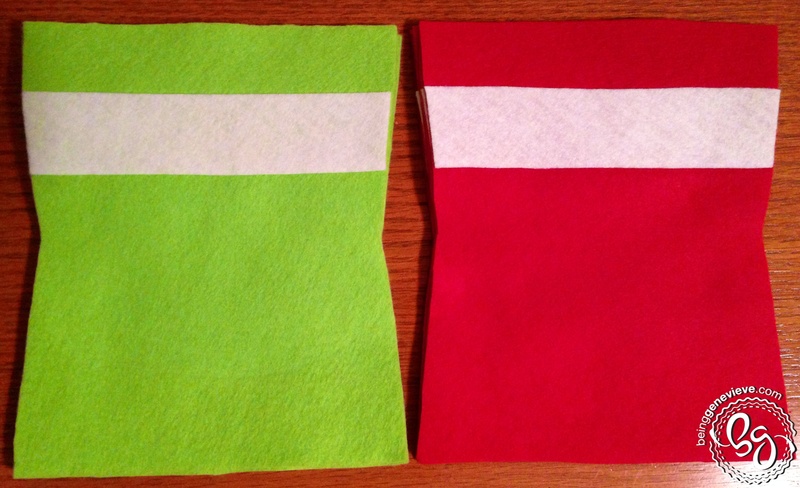 (Feel free to sew it on, but do it before you sew the two sock cuff pieces together at the very beginning.) 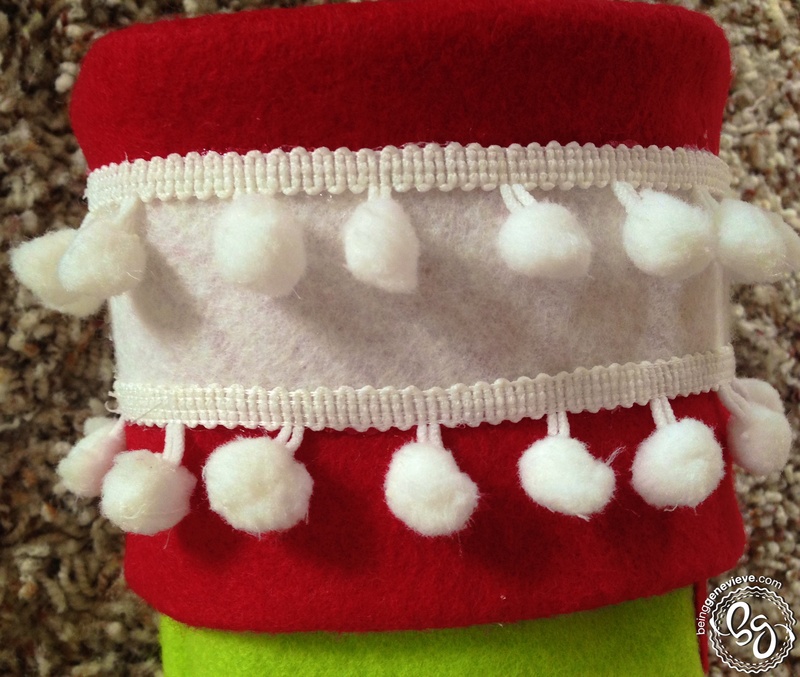 Hot glue the fringe on top of the white stripe of the stocking cuff as I did in the picture below. You are done! I hope you enjoy your new super cute stockings! I was just wondering how many stockings this will make? 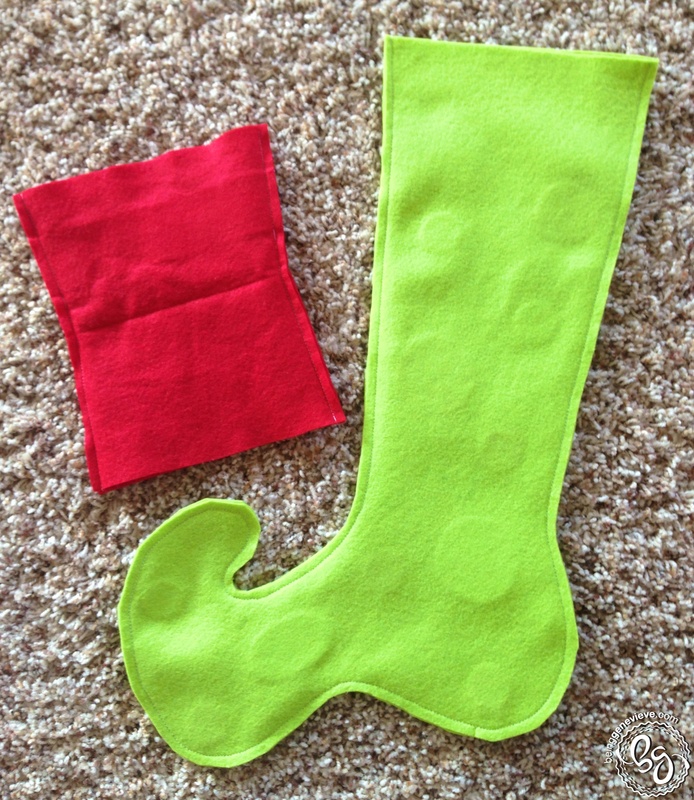 I think that the measurements I provided will make 1-2 stockings. 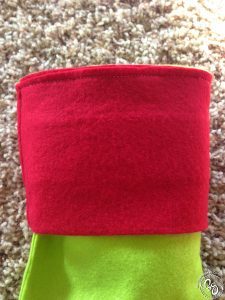 The stocking finished dimensions are: Top down to the heel is 17″, heel to the toe is 9-1/2″, and the width of the top is 6″ (just remember that you will need two of these for one stocking – the front and the back). I am sorry, but I can’t remember the width that felt off of the bolt comes in. I apologize I am not more help. How do I print out your instructions? Click on the download button and you should be able to print once you download the file. If this doesn’t work, please let me know. I can e-mail it to you and fix my files, if I need to. Are you using a 5/8′ to sew? or 1/4′? Thank you for the pattern. I love it. Thanks for the comment Mary! It means a lot to me, really. 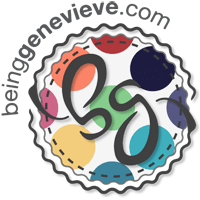 I have been struggling (for almost a year) with if I should keep blogging or just shut down my blog. I didn’t know if it was helpful to anyone that was visiting it. Thank you once again! I’ll start putting some more posts together. Cute and very whimsical. I love this idea, and your finished product is very professional. You should sell your designs on Etsy. I would definitely buy them. Thank you Dominique! I will consider selling my stockings online. 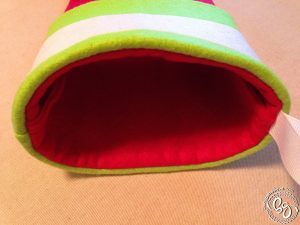 I currently have 5 boys under the age of 9 so I can’t really figure out how to find the time to make/sell my items. This is one reason I have the step by step tutorials on my site.